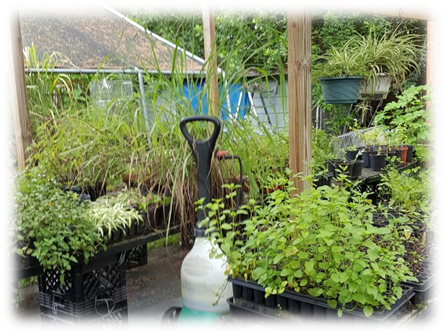 We are a small, family owned and operated nursery located in almost-rural Punta Gorda, Florida. Each plant is grown right here, from cuttings taken from our own plants or from fresh, non-GMO seeds. We grow our plants without chemical additives. Only a soiless mix is used for our plants to prevent spread of nematodes and other little unwanted critters that can live in real “dirt”. Our little nursery is fully licensed and state inspected. We can ship to all the lower 48 states… although we choose not to ship to Arizona because of that state’s restrictive quarantine policy. You can visit us on Saturday and Sunday at the American Legion Post 103 Outdoor Market, located at 2101 Taylor Road, Punta Gorda, Florida, 33950. Hours are from 8AM – 2PM, beginning October 1st. 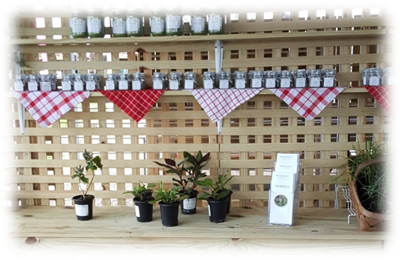 We grow HERBS, both culinary and medicinal… MINT, lots and lots of varieties of mint…. VEGETABLE PLANTS, whatever is in season…… And an evergrowing assortment of TROPICAL PLANTS for your yard, garden, lanai or even indoors.